Of all the subjects in business it seems that marketing attracts the most B***S***. With reference to the old cliche “BS baffles Brains”, there is nothing that experts in a field prefer to help increase their status than the mystification and subsequent confusion of a their topic. This book is a great antidote to the self-inflation of professional marketeers who, I do not dispute, have a role in large businesses. Full of pragmatism, common sense and relevant ideas it is above all straightforward to read and act upon. This is a great book for all small business owners and managers. My advice is to buy it, read it, re-read it whilst taking notes and then take action. John Jantsch understands that if you’re the principal of a small (or should that be micro?) business you have to be the one doing the marketing but you also have to wear many other hats so there is little time to devote to grand but impractical schemes. Originally by George Bernard Shaw but used by John Fitzgerald Kennedy in his address to the Oireachtas Éireann 50 years ago this week. 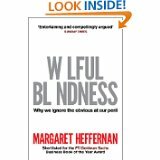 In her latest book, Heffernan argues that the biggest threats and dangers we face are the ones we don’t see – not because they’re secret or invisible, but because we’re wilfully blind. She examines the phenomenon and traces its imprint in our private and working lives, and within governments and organizations, and asks: What makes us prefer ignorance? What are we so afraid of? Why do some people see more than others? And how can we change? Examining examples of wilful blindness in the Catholic Church, the SEC, Nazi Germany, Bernard Madoff’s investors, BP’s safety record, the military in Afghanistan and the dog-eat-dog world of subprime mortgage lenders, the book demonstrates how failing to see—or admit to ourselves or our colleagues—the issues and problems in plain sight can ruin private lives and bring down corporations. The book explores how wilful blindness develops and then goes on to outline some of the mechanisms, structures and strategies that institutions and individuals can use to combat it. Essential reading for anyone involved with healthcare particularly the NHS – its publication in the same month as the Francis report into North Staffs is presumably coincidental – you’ll learn more from this book than the report. Steven Pressfield’s first non-fiction book was “The War of Art” and is essential reading for anyone with a tendency to procrastinate who needs help them get out of their own way. His most recent “Turning Pro” takes the battle against “Resistance”, as he calls it, to a higher plane. Easy to read, with brief chapters, the book is divided into three sections. Firstly there is “The Amateur Life” with descriptions of what happens in your amateur life before you become professional or “Turn Pro”. Next is the section “Self-Inflicted Wounds” which describes the states of the Amateur and the point at which it becomes necessary to “Turn Pro”. If you wrestle with your commitment or feel that you could and should be better than you are then this book is a must read. But be warned. “Turning Pro is free, but it’s not easy, it demands sacrifice but you will find power, your voice and self-respect.“ It’s a book that I wish had been compulsory reading on my undergraduate curriculum. The study explored the influence of three key risk factors for periodontal disease – smoking, diabetes and genetics – on tooth loss given varied frequencies of preventive dental visits that included cleanings. By examining claims data from 5,117 patients without periodontitis throughout a 16 year period and conducting genetic testing, researchers determined that patients with genetic variations of the IL-1 genotype, or one or more other risk factors examined, were at significantly increased risk for tooth loss and therefore require more preventive dental care. The IL-1 genetic variation was the single most prevalent risk factor – nearly one in three Americans carry this genetic variation. This study demonstrates the important opportunity to provide more effective preventive oral care through the use of risk-based patient assessment that includes genetic testing. “Dentistry has long been a leader in the delivery of preventive healthcare to patients. The findings of this study provide dental clinicians with the opportunity to offer personalized, preventive care that is based on new insights into the importance of genetic risk factors,” said Dr. Kenneth Kornman, Chief Executive Officer of Interleukin Genetics, which developed the genetics test used in the study. Periodontitis initiation and progression is driven by two factors: bacterial plaque that initiates the disease and the body’s inflammatory response to bacteria which, when overly aggressive, causes breakdown of the bone and tissue that support the teeth. This inflammatory response varies greatly within the population and is significantly impacted by individual genetic make-up. Genetic testing can identify patients who have an increased inflammatory response to oral bacteria which significantly increases risk of periodontitis and tooth loss. Smoking and diabetes also contribute significantly to the risk of periodontal disease. Perio and General Health. The Vital Connections. Interesting video from The European Federation of Periodontology on the connection between Perio and General Health. Worth a watch with a cup of tea.